The U.S. government is not too much associated these days with border-erasing, multinational cultural projects. Which perhaps makes Ladama’s existence even more compelling. According to their website bio, the group’s core members met in 2014 “while touring Los Angeles, Arizona, and New Mexico as part of the prestigious OneBeat Program.” For those not familiar with it, OneBeat is, according to Wikipedia, a “program that brings together musicians from around the world to share and collaborate musical ideas and projects” and is partly sponsored by the U.S. Department of State. For those who wonder if their tax dollars are paying for anything positive, perhaps here is a small bit if light. While on that 2014 tour, which involved both performing and leading workshops and public music-making events, the four women of Ladama — Lara Klaus, Daniela Serna, Mafer Bandola and Sara Lucas, who are from Brazil, Colombia, Venezuela and the United States — “uncovered a common dream of building communities through sound and empowering women and youth through music,” their website. 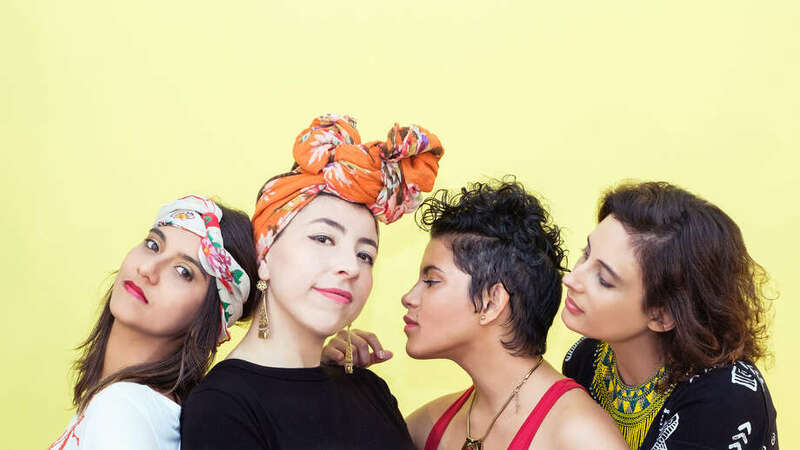 Their sound, which the band calls “Latin alternative,” has been described as a fusion of “sounds from South America and the Caribbean with soul, R&B, and pop.” Their website states Ladama’s artistic aim is to prove “that borders are meaningless, transporting us to a future where the world communicates across continents and cultures, through sound and story.” A noble mission, many would say. 7 p.m. Friday. $20. Sanctuary for Independent Media. 3361 Sixth Ave., Troy. 272-2390. mediasanctuary.org.